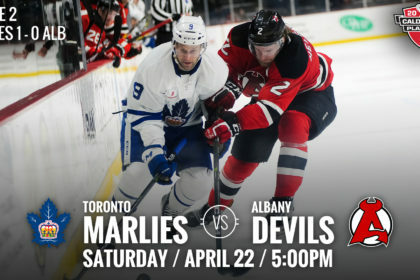 ALBANY, NY — The Albany Devils finish their home stand against the Toronto Marlies in Game 2 of Round 1 of the Calder Cup Playoffs Saturday at Times Union Center. 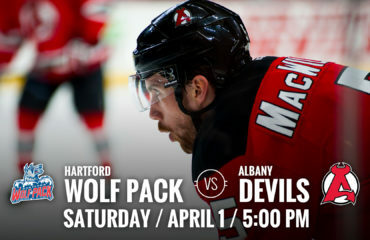 The Devils won Game 1 in a 3-0 shutout Thursday against the Marlies and are up 1-0 in the best-of-five series. Brick Wall Blackwood: Mackenzie Blackwood registered his first professional post-season shutout Thursday in the 3-0 victory. He had three shutouts during the regular season and ended the regular season with a 17-14-7 record. 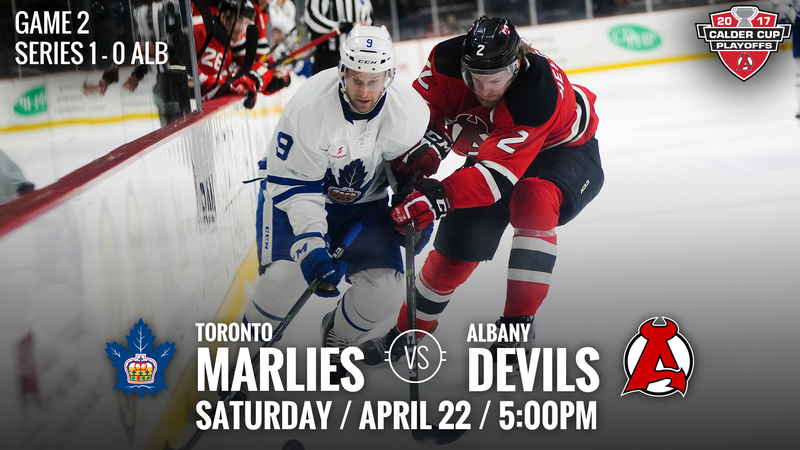 It Took Five: Five different players each earned a point in Thursday’s shutout victory over the Marlies. John Quenneville netted an unassisted power-play goal, Seth Helgeson earned the assist on a Ben Thomson goal and Nick Lappin registered the assist on Brian Gibbon’s empty-net goal to seal the 3-0 win. Keeping Watch: The other North Division battle between the number one seed Syracuse Crunch and number four seed St. John’s IceCaps got underway last night in St. John’s. The IceCaps pulled out the win over the Crunch in a 2-1 victory.